No racing this weekend and only light training now until the Argus on the 11th March, which gives some time to update on progress with the new bike. Or more accurately at this stage, the slowly accumulating pile of pieces that will hopefully all come together successfully in the form of the new bike. The first delivery arrived a few days ago from SJS Cycles in the UK. Most significant are the two silver components on the boxes – the dynamo hub and the LED front light that it will power. These small, excruciatingly expensive pieces of German engineering are defacto choices for serious audaxing. I just hope that their reputation is worthy of the cost and distance they have travelled. 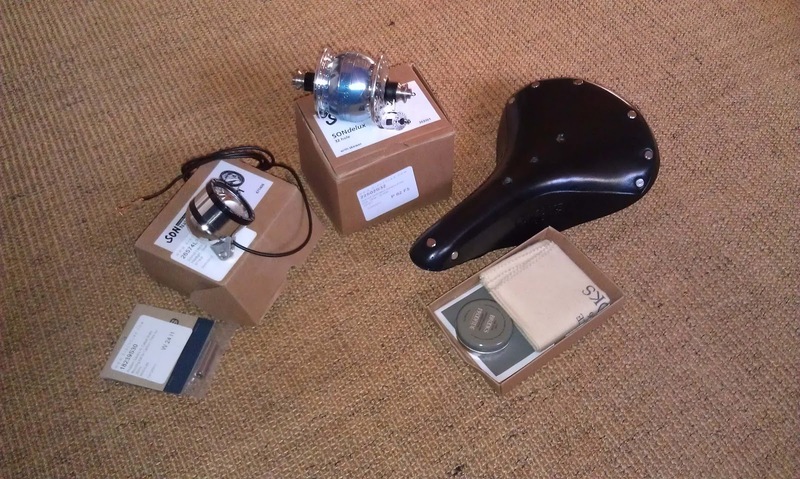 Also pictured are the Brooks B17 saddle, and it’s saddle conditioning care kit. These also appear to be an almost automatic choice amongst long distance riders, but at this stage I cannot fathom why. I’m convinced the saddle would be only slightly harder if it was entirely fabricated from diamonds. I’m told that regular applications of the leather cream, and about 500km of riding will see it nicely softened and formed to my backside (or more likely my backside formed to it). Either way, at this stage I’m rather doubtful that it’s surface and my behind will have anything other than the briefest of encounters. Another major milestone has been finalising the frame design with Justin Burls. 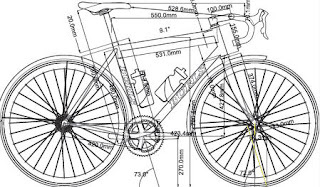 Justin’s interpretations of my measurements and descriptions of riding style were spookily close to Merry’s current dimensions even in his first CAD drawing. 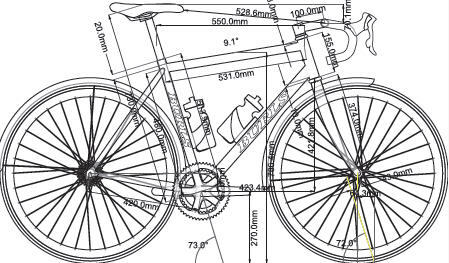 A few emails ironed out the remaining kinks: lengthening the head tube a tad for more upright without an unsightly spacer stack; and room for mudguards with longer chainstays and altered fork angle to reduce toe overlap. I’ve also pretty much settled on an Ultegra groupset. The luscious Italian lines of Campagnolo Chorus had me mesmerized for a long time. In the end though, the need for a special £200 tool to link or repair the 11 speed chain was a deal breaker. Not just for the ludicrous cost, but also the impracticality of carrying such a bulky item on a long ride. You can be sure the one tool you don’t have is the one you’ll most need, and that made the risk just too great. The chances of being able to find spares for and repair Shimano out on the road made it a much simpler choice even without the incentive of cost saving. The use of mudguards and Kinesis DC07 forks also helped in the Shimano decision. The best choice for the long drop brake calipers that are needed to fit around mudguards looks to be the Shimano R-650s. These would look so badly wrong on a bike with an otherwise Campagnolo groupset – Nike sneakers poking out under an Armani suit. Although I’ve yet to source the Ultegra components, I found a great deal on the calipers from Buy Cycle, so with luck these should be here by the end of the week. All positive strides towards the new ride and something to look forward to after the Argus. During the Argus though, I’ll be one of many cyclists who pedal just that bit harder up Suikerbosse in memory of South African cycling legend, Ertjies Bezuidenhout, who passed away today.